InjuredPixels provides a simple way to spot dead or stuck pixels (which are always black, or showing the same colour) on an LCD monitor. To begin, just launch the program and it'll display a solid colour all across your screen. Stand back, look at the whole display, and if there are any pixels displaying a different colour then they should stand out. This can be difficult to tell for sure, of course, especially if the problem pixel is stuck at a similar colour. And so InjuredPixels also lets you change the colours it displays. You can jump straight to a particular colour by clicking its number (Red=3, Green=4, Blue=5 and so on); you're able to cycle through the various possibilities by pressing the left and right cursor keys; or pressing R will select a colour at random. And simply moving quickly from one colour to another should help to spot any pixels which aren't working as you'd expect. 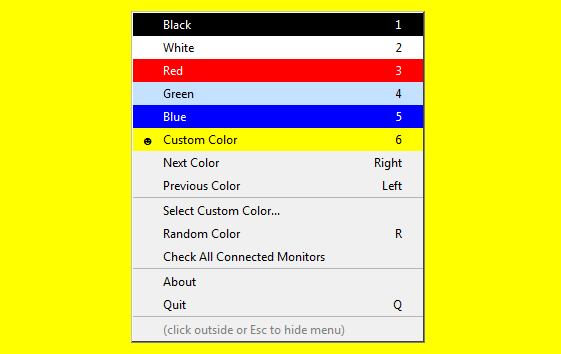 The InjuredPixels menu displays details on all of this, and includes other options to define and use custom colours, or display its colours on all connected monitors. The menu will also disappear sometimes, which is disconcerting, although necessary (if it's displayed over a stuck pixel then you might miss it). But you can always press Esc to toggle it on and off, or Q to quit the program automatically. InjuredPixels can be a useful displaying testing tool, then, but perhaps the most interesting aspect of the program is that it comes in the form on an HTA file, an HTML Application. Apart from being portable and highly compatible (it'll run happily on Windows XP-8), this means it's also relatively easy to customise, at least if you have some basic HTML and programming knowledge. Just open injuredpixels.hta in Notepad to see how it works.